During the Harlem Renaissance, several literary periodicals encouraged African American women to submit poetry, short stories, essays, or other literary contributions for publication. Opportunity magazine was one such periodical that made immeasurable contributions to the careers of many female African American writers. 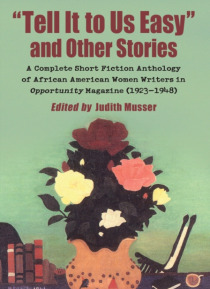 This anthology collects all of the short stories published in Opportunity… by African American women during the magazine's 25 years of publication. It includes works by both well-known authors (Zora Neale Hurston, Marita Bonner) and more obscure writers. There is also an additional African tale translated by Violette de Mazia, a white woman known for promoting African American art. It also includes an introduction which contextualizes the short stories historically in light of the overall development of African American writing.